Your Southeast Texas Connection to the World. 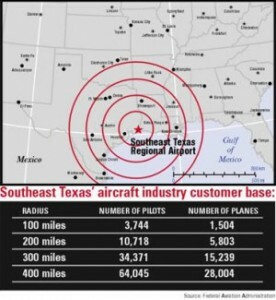 The Jack Brooks Regional Airport, located in Jefferson County, serves an expanding regional population base in excess of 500,000 with connections to Texas and the world. We are located just minutes from anywhere in the Beaumont, Port Arthur, and Orange geographic areas and only an hour from Lake Charles, Louisiana and Houston, Texas. 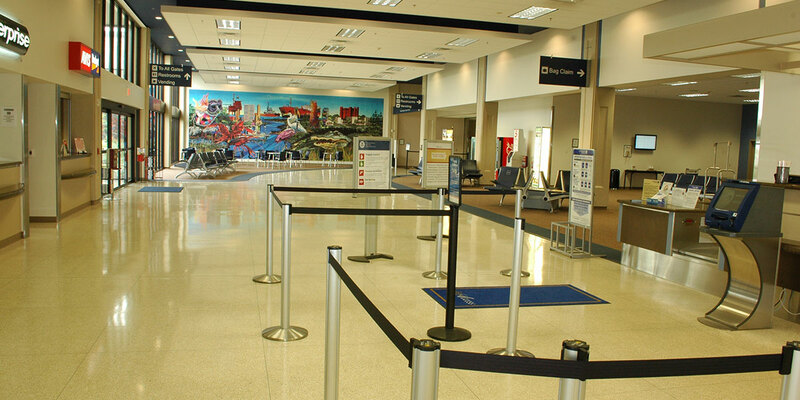 Over 30,000 passengers a year choose Jack Brooks Regional Airport with free parking just outside the entrance to our newly renovated (Spring 2009) 24,000 square foot terminal and quick check-in and security checks. Business and personal travelers find this more adaptable to their busy schedules and more affordable than the 3 to 4-hour round trip to Houston, additional time of check-in and security and the increasing cost of fuel for the trip and parking. Transportation is both diversified and close. Thirty (30) trucking companies, deep-water ports in Beaumont, Port Arthur and Orange, three Class A rail lines with connections to the deep-water ports in Beaumont, Port Arthur, and Orange. Only 90 miles from Bush Intercontinental and Hobby Airports in Houston, the Jack Brooks Regional Airport provides affordable access to world-wide travel, commerce, and recreation. Southeast Texas is enjoying yet another boom in the petro-chemical industry, with several billion dollar projects underway and planned for the next 10 years. Along with the current and projected employment increases have come hundreds of new retail outlets and restaurants to further diversify the economy. Additional areas of growth have been in healthcare, with two new hospitals, research and development; food processing, tourism, aircraft and metals and construction. Employment opportunities abound in Southeast Texas. Industrial, manufacturing, commercial and retail job opportunities are abundant in Southeast Texas. The area is rich in skilled labor as well as degreed professionals, and training is readily available. Lamar University, Beaumont, Lamar Institute of Technology, Lamar State College in Port Arthur and Orange as well as ISTC, the Industrial Safety Training Council, and numerous trade schools afford residents a myriad of degree plans and specialized skills training. Situated on more than 1,180 acres, JBRA offers two runways with approach markers to accommodate commercial and executive aircraft. One runway is equipped with Instrument Landing System (ILS).